Porphyritic texture. 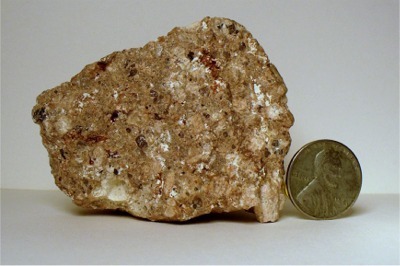 Contains quartz and sanidine feldspar phenocrysts. Found locally in gravel apparently shipped in from the Western United States. Contains quartz phenocrysts and jasper. Found locally in gravel apparently shipped in from the Western United States. Formed by gas bubbles in extremely hot lava. 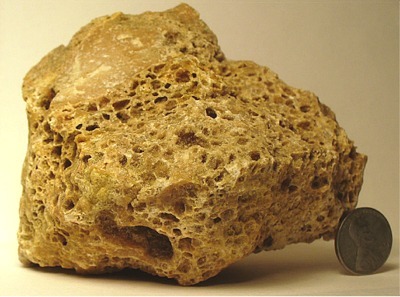 When the vesicles or cavities contain mineral crystals it is called amygdaloidal basalt. 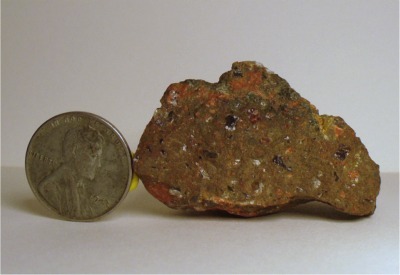 Some cavities in this rock contain geodes with tiny quartz crystals. A large quartz crystal can be seen on top left. Minor amounts of feldspar are also present. The basalt is generally dark but weathers to a lighter color. Found locally in scenery gravel.